Conversations, discussions and behind the scenes from Fireside, an off-the-grid and disconnected retreat for entrepreneurs, founders and investors. Highlights from the weekend and interviews with the conference founders, Daniel Levine and Steven Pulver. 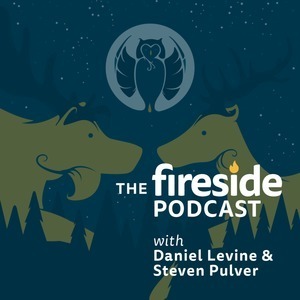 Welcome to the Fireside Conference Podcast - a rambling (in a good way) chat with founders Steven Pulver and Daniel Levine. Part 4 of 4. Four days until Fireside 2018! Part 3 of 4. Four days until Fireside 2018! Part 2 of 4. Four days until Fireside 2018! Part 1 of 4. Four days until Fireside 2018! In this episode we interview Andrew Askins, curator of the Startup Watching Newsletter - startupwatching.com - a twice-weekly newsletter about and for startups. Welcome to the Fireside Conference Podcast - a rambling (in a good way) chat with founders Steven Pulver and Daniel Levine with occasional interjections from Producer Tom. In this episode we interview Sol Birenbaum, co-owner and Camp Director of Camp Walden, by the shores of Walden itself. Sol is an inspirational leader and lifelong entrepreneur. He’s in his 15th year as owner of Camp Walden, the venue we call home for Fireside. Sol has been a mentor and inspiration to the entire Fireside team since its inception and we are honoured to have him as our first official Fireside Podcast guest. This week we discuss (amongst other things): the plural for more than one hiatus, risqué art, New Orleans and Collision Conf, Boston (Massachusetts not Lincolnshire), Giant Oysters, Andrew Warner and Chemda from Keith and the Girl, Paul Larche and his band, Hover.com, ad music. Welcome to the Fireside Conference Podcast for 2018 - a rambling (in a good way) chat with founders Steven Pulver and Daniel Levine with occasional interjections from producer Tom. This week we discuss (amongst other things): the difference between UK and Canada dialing codes, the Podcast’s running time, Follow-up on mirrorgate, Erica, The Ski Drop Challenge, different time zones, Leafs Bandwagon - Is it time for Tom & Steven to join, The cases for baseball, basketball and (ice) hockey, Jiffy Pop and more snack talk, and two special shoutouts. A brief sports warning - there is a large amount of sport talk in this episode, and the guys are honest with their opinions. Please don’t take it too seriously. Welcome back to the Fireside Conference Podcast for 2018 - a rambling (in a good way) chat with founders Steven Pulver and Daniel Levine with occasional interjections from producer Tom. This week we discuss (amongst other things): Fireside’s charity involvement and money raised last year, Adam Caplan, The gang’s waterskiing ability and Steven’s bet, Costco and Sleeping Bags, Listening with Erica, Follow up on the Jeff Pulver and Andrew Warner interview and video, more (surprisingly controversial) tips for camp.. This week we discuss (amongst other things): The gang’s Homepods, Podcast Cover art and Analytics, Getting the word out, Andrew Warner and Jeff Pulver, Sleeping at camp, the Fireside Website, Food, Ticket updates, Fireside 2018 Art and Artists.. This week we discuss (amongst other things): How (not) to use a blue yeti microphone, Steven’s Wife’s Grandfather’s surprisingly well made fake iPhone, Follow up on speaker recommendations, podcast analytics, Possibly-incorrectly-named “positive reinforcement”, Missing the L-Spark SaaS Product Showcase, European Attendees, Attendance forms responses list, Daylight Savings Time. Episode 4: Ontario to Yorkshire.. This week we discuss (amongst other things): an update on ticket sales, returning alumni, possible swag, future speakers, and more tips for the full Fireside experience! Recorded on Tuesday 5th September 2017, on our drive from Toronto up to the Fireside location - Camp Walden, Palmer Rapids. With Steven at the wheel, and Daniel (plus producer Tom) keeping him company on the ride up. We discuss our excitement with finding the Podcast on iTunes, our tips for camp, and some extra details on the history of Walden. Once again the topic falls on to food, including some of the amazing meals that you'll be experiencing over the weekend! A special announcement about your free Kawartha Dairy ice cream can also be found within this episode..
Oh, and another announcement about our first (and hopefully not last!) Carpool Karaoke project - keep an eye on your email over the next 24 hours for further details. Our inaugural episode of The Fireside Podcast. In the last few days before Fireside Conference 2017, founders Daniel Levine and Steven Pulver talk about some of the progress, the ethos for Fireside, and most importantly discuss types of candy..! We have also included the full version of episode 18 of The BatLabels Label-Cast which was kindly donated to us by the host, Aaron Reynolds. This episode was recorded live at Fireside 2016, and our warmest thanks to Aaron for telling his 'origin story'! Keep posted to this feed during the week starting 4th September (2017), and we look forward to seeing you by the campfire from Fri 8th!